Take space in our own suites. Discover IX Reach's own purpose-built, high-spec suites in London and Manchester - two of the biggest telecoms hubs in Europe. Did you know IX Reach has its own colocation suites? Keep scrolling to discover our two highly-connected UK Global Carrier Centres (GCCs)! 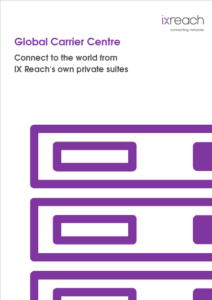 IX Reach’s Global Carrier Centres (GCCs) offer unrivalled colocation in the two most connected UK cities. Located in Equinix’s LD8 facility at London Docklands – the heart of the City of London. Located in Equinix’s MA1 facility in Manchester’s Science Park. Why take space in the GCC? You’re in the heart of two major European locations for PoP deployment. You’ll have direct access to 150+ global and local carriers. You’ll receive preferential pricing on all IX Reach’s services. You can have same day cross connects provisioned within the suites. You’ll have access to all 170+ PoPs and solutions including Cloud platforms and remote peering. You can have exclusive connectivity and fractional options not available through the facility operator. Looking for colocation space outside the UK? IX Reach’s partnerships with both large global data centres and smaller independent facilities means we’re able to offer unparalleled solutions across Europe, North America, Asia, Africa and the Middle East. Get in touch with the team today to discuss your global colocation needs! Interested in benefitting from GCC and other DC space?